Need to Light Up an Outbuilding Mains Free? Welcome to the PowerBee Range of mains free Shed & Outbuilding Lights. Effective safe mains equivalent lighting that works all year round. From small garden sheds to large stables & barns. We have the Indoor & outdoor solution you need. 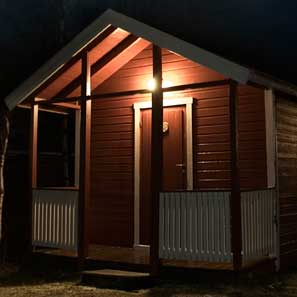 We offer solar and battery powered Shed lights that really do work well. Solar or Battery Powered Shed Lighting? We have PIR (motion sensor) & remote controlled storage lights. Security and flood lights for inside & outside the shed. We have it all covered.